Day 8: TGIF Camping Time! WooHoo!!! It’s Friday!! We finally made it! Hopefully you are going to have awesome weather this weekend, and maybe you’ll decide to go camping! I hope my friends in Hawaii are faring well! So, I made this fun card for a swap at my up-up- upline’s meeting 🙂 It was a lot of fun to make. I used quite a few techniques, including alcohol backgrounds, masking, and a 3D window! If you’re interested in learning some new techniques, feel free to check out my Technique Club! I got a huge response from this card at the meeting, so I hope you enjoy it! The base layer is on watercolor paper, then there is a layer of dimensionals, a window sheet, then another layer of dimensionals, and the frame on top. 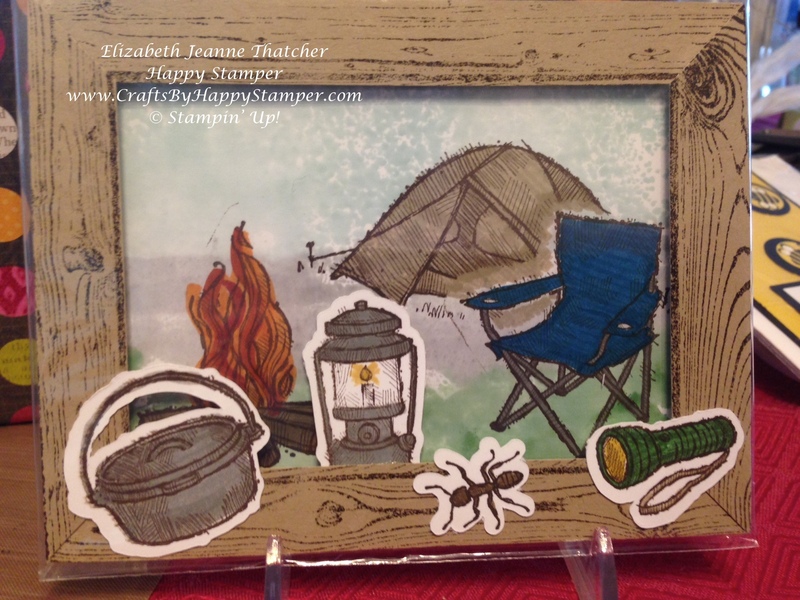 The camping supplies are die cuts that I made to go along with The Great Outdoors Set. You can purchase them from my Etsy store under Shop Now. Previous Layout 7: Christmas is so much fun with coordinating stamps!